Three men, including Lurgan republican Colin Duffy, have gone on trial accused of a range of terrorist-related offences connected to a gun attack on the PSNI in 2013. The three accused are Colin Duffy, Harry Fitzsimons, 50, and Alex McCrory, 57. All three deny all of the charges. Mr Duffy, 51, is accused of preparing and directing terrorism and being in the IRA. 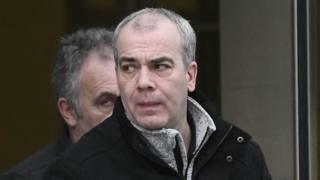 Mr Fitzsimons is accused of attempting to murder members of the Police Service of Northern Ireland (PSNI) in the Crumlin Road area of Belfast on 5 December 2013. He is also accused of having two AK47 assault rifles and ammunition with intent to endanger life, as well as preparing and directing terrorism, and being in the IRA. Mr McCrory is accused of attempting to murder members of the PSNI in the Crumlin Road in Belfast on 5 December 2013. He is also accused of having two AK47 assault rifles and ammunition with intent to endanger life, as well as preparing and directing terrorism and being in the IRA. The men appeared before Belfast Crown Court. A prosecution barrister told the court that three PSNI vehicles were travelling in convoy when they were attacked in 2013. The police officers were on their way to a nightly demonstration at Twaddell Avenue in North Belfast, where a protest camp had been set up after an Orange Order parade was banned the previous July. The barrister said shots were fired from scaffolding, in Herbert Park, as the police convoy travelled towards the Ardoyne roundabout, at about 19:00 GMT. He said a car, with a weapon inside, was found later at Butler Place , and a second AK47 was found the following morning lying beside a bush in Elmfield Street. The prosecution also alleges that all three defendants were recorded the following day on covert devices placed at a public park in Lurgan. He said it is the prosecution's case that the three men were planning "how to go forward" and "regrouping" after the attack. The audio recording, which an expert had deemed "poor to very good quality" was played in court on Tuesday morning. The barrister also explained that experts had compared the voices on the recording with samples of the three defendants' voices. In the case of Mr Duffy, a voice sample was taken from a press conference he had previously attended. After the recording was played to the court, lasting almost an hour, the prosecution barrister said it indicated part of "a joint enterprise". He said the men were discussing a "terrorist event" and he pointed out that the alleged conversations between the three men referred to "a lack of weapons in the north". He said the prosecution believes that Mr Duffy told Mr Fitzsimmons and Mr McCrory, during the recorded conversations, that "the main thing is that no one has been caught". The barrister said prosecutors believe the case is linked to a "faction of dissident republicanism".